Josenhans FF ~ Tangier Slam is Alive and Well! 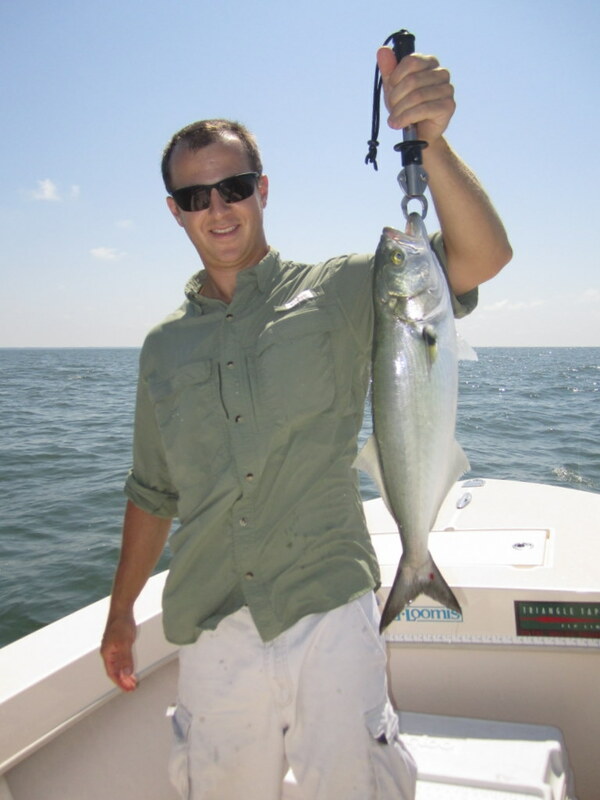 The Tangier Slam – or one version of it – is usually considered catching a rockfish, bluefish and speckled trout on fly during the same day. Well, this is the time of the year to come on down and give it a shot. That is, if I can get you away from the blues once you get here. Yesterday, we had six of the prettiest speckled trout that you ever want to see from 16″ to 20″ that we caught during a quick stop on the way in from a very successful day of watching rock and blues knock our poppers all over the sound. When the weather has cooperated, the fishing of the past two weeks has been phenomenal! Here is a brief summary of some of the highlights. 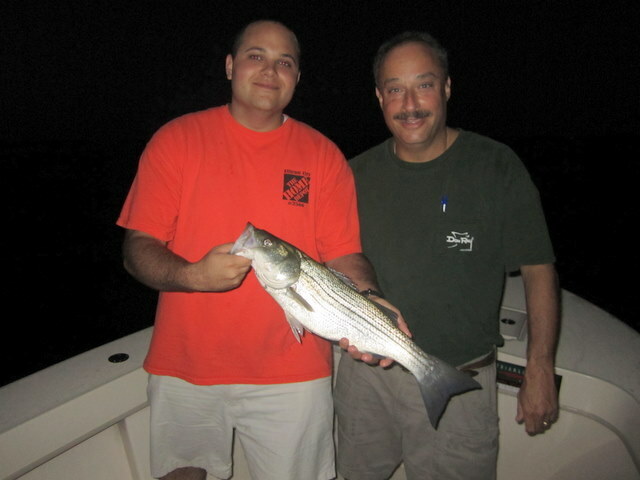 Monday, September 12 – Today I had the pleasure to fish with The Frederick News-Post Outdoors Editor Jim Heim. Jim writes the Casts and Shots column for the paper and I was hoping upon hope that the fishing this day would be worthy of a small article. Boy, did the fish ever hold up their end of the bargain. We started the day near Tangier Island casting Storm Chug Bug and Stillwater Smack-it! poppers to ravenous rockfish in four feet of water. Most of the rock were in the 18″ to 24″ range, and they really put on a topwater show in that skinny-water. After two to three hours of nonstop action, we traveled across Tangier Sound to find hungry two to five pound bluefish ready for an encore. Only difference here was that there’s no quit in bluefish. Same lures, same surface explosions, but each fight lasted several minutes longer. I think Jim’s arms were sore at the end of the day. That’s a good thing if you’re a guide… See Jim’s article at the link for Casts and Shots. 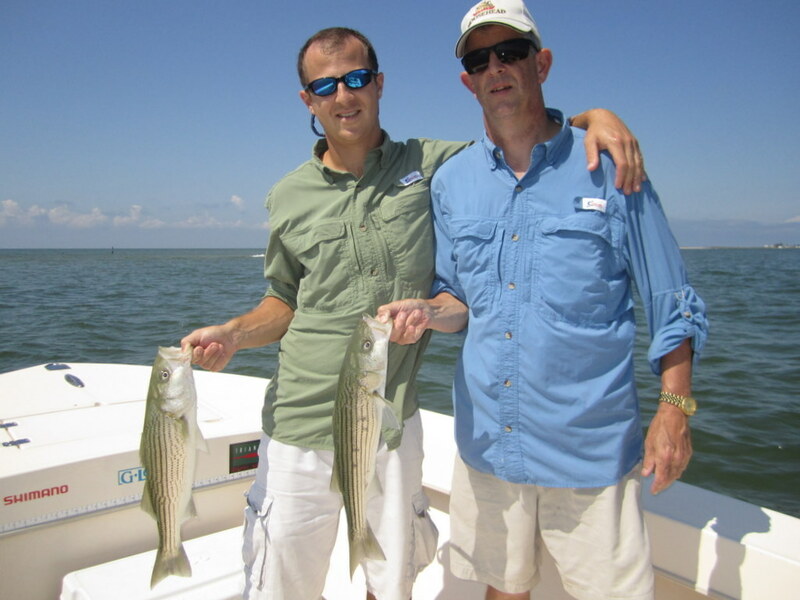 Tuesday, September 13– Lew Armistead and Donny McDougall brought their fly rods and were greeted with ‘slick cam’ conditions on Tangier Sound. We started off the day catching a few rockfish on sinking lines, but it didn’t come close to the top-water action that we had enjoyed the day before. 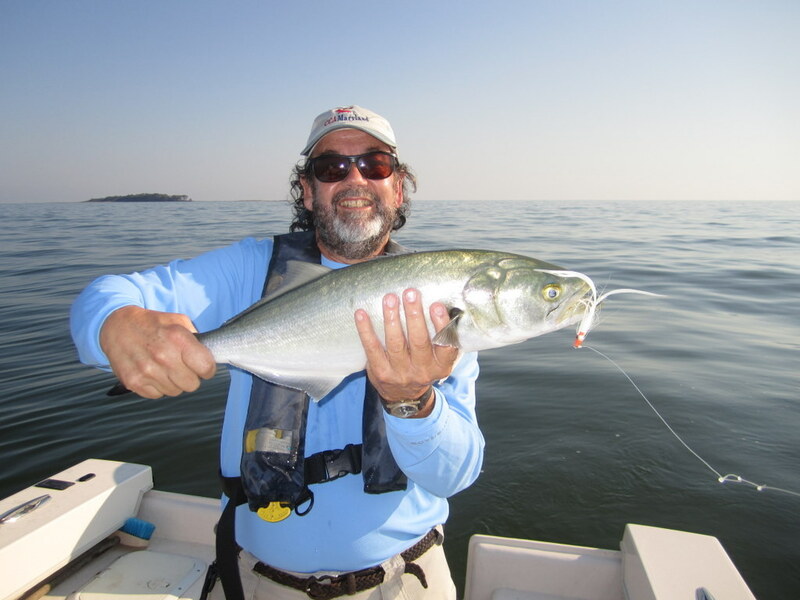 With bluefish waiting to please, I pointed the bow east and told the guys to hang on. Upon arrival at a spot near Watts Island the guys were hooked up almost immediately. While Clousers and sinking lines worked well, both Lew and Donny quickly switched to floating lines and Gurglers for some of the most exciting top-water fly action that I have witnessed in a long time. Two to five-pound blues slashed, crashed and dove on top of the popping Gurgler, until both flies needed the occasional field repair. A simple piece of 15# monofilament was all that was required to restore the Gurgler to “nearly new” condition. Lew asked me what type of knot I had used to make the repair and I replied “lots of knots!” There’s no time for perfection during the heat of battle, therefore, I believe it was Lew who coined the name “Triage Knot.” I wonder if I should get a patent?? We even saved an hour at the end of the day to catch four gorgeous specks to 20″ up near Fox Island, thus, both Lew and Donny were able to accomplish the ‘Tangier Slam!’ Nice going guys. Josenhans Fly Fishing ~ Specks and Blues!! Since the double-whammy of Hurricane Irene and Tropical Storm Lee have muddied mid-bay waters I have been spending most of my time fishing out of Crisfield, MD. 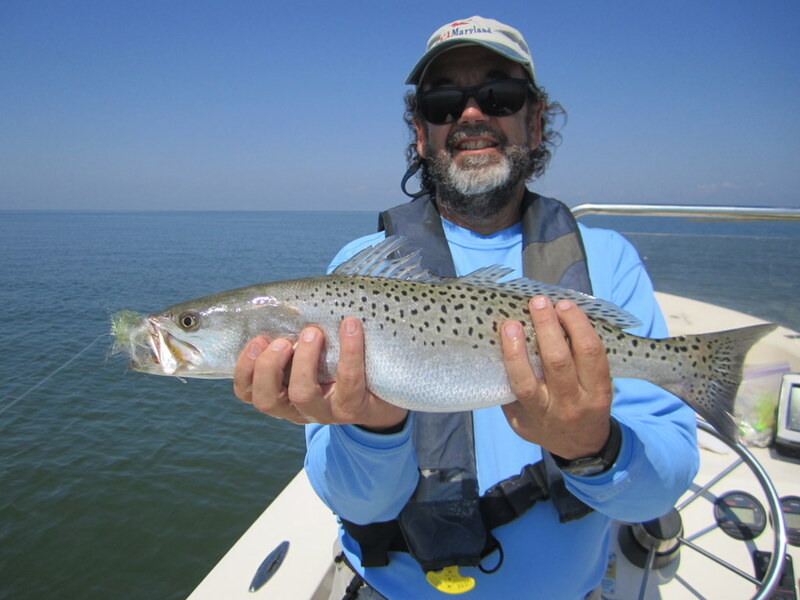 Speckled trout have been available, though finicky at times, as well as stripers and blues. 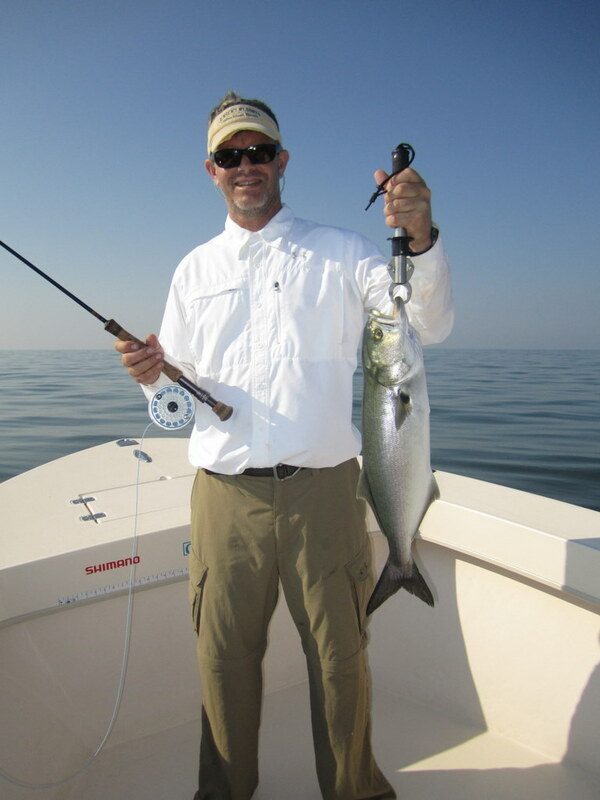 While the specks are fun, it’s been bluefish that has everyone talking. Averaging 2 to 5 pounds, we have been enjoying some fantastic fly and light tackle fishing for these scrappers, that seem to be endowed with an endless supply of energy. An added bonus is the aerobatic display put on by many, as they often jump like baby tarpon. What a blast this has been! 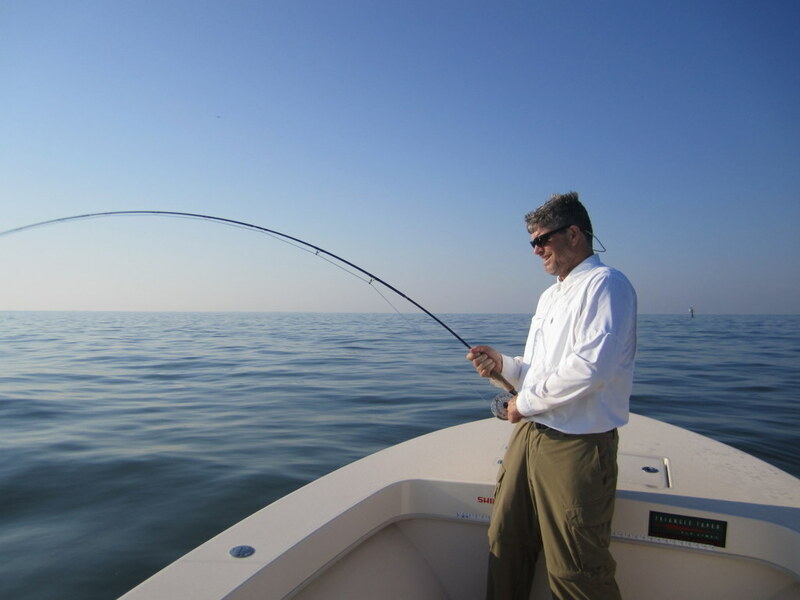 Casting in the clear waters of lower Tangier Sound (no adverse affect from the tropical weather here) my anglers have usually given-up before the blues. While I’m not sure what effect the recent cold front will do to this action, I expect they will be around for at least another couple of weeks. 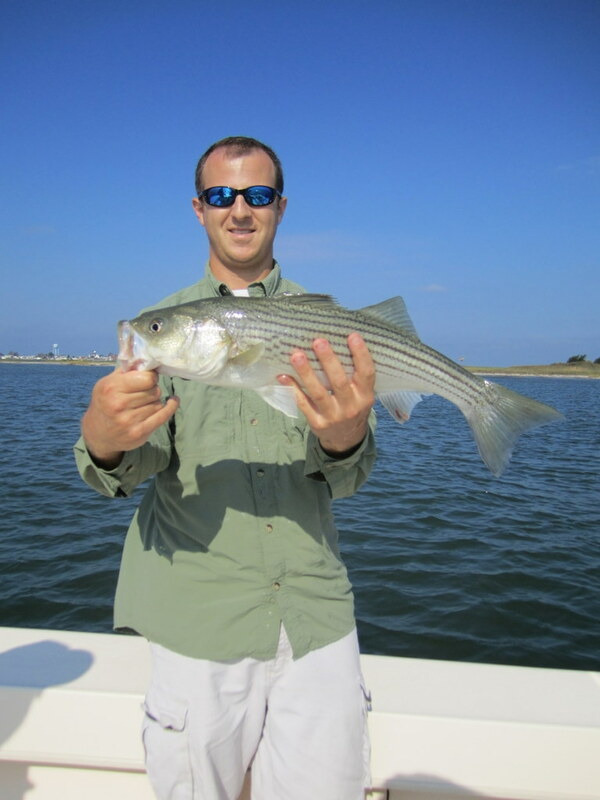 VA striped bass season returns on October 4th, so I can stop worrying about which side of the line I am on should someone wish to take home a couple of rockfish fillets. Here is a rundown of some of the action from the past two weeks. 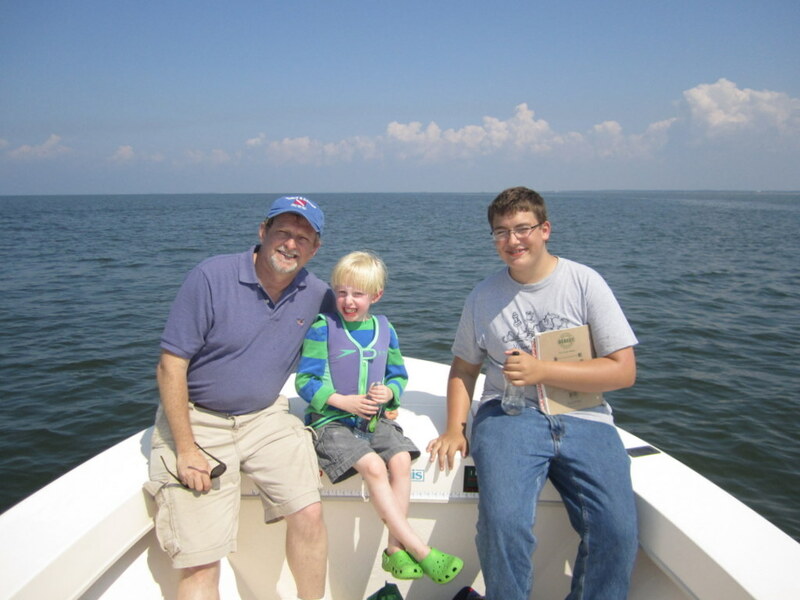 On Thursday, September 1, I fished with Andrew David and his son James out of Madison. As we skimmed across the glass-like waters of the Little Choptank we kept an eye out for diving gulls; second only to “bent-rod sonar” as a means of locating feeding schools of fish. We were soon rewarded with a patch of surface feeding stripers and blues, just off the False Channel, near the mouth of the Choptank River. 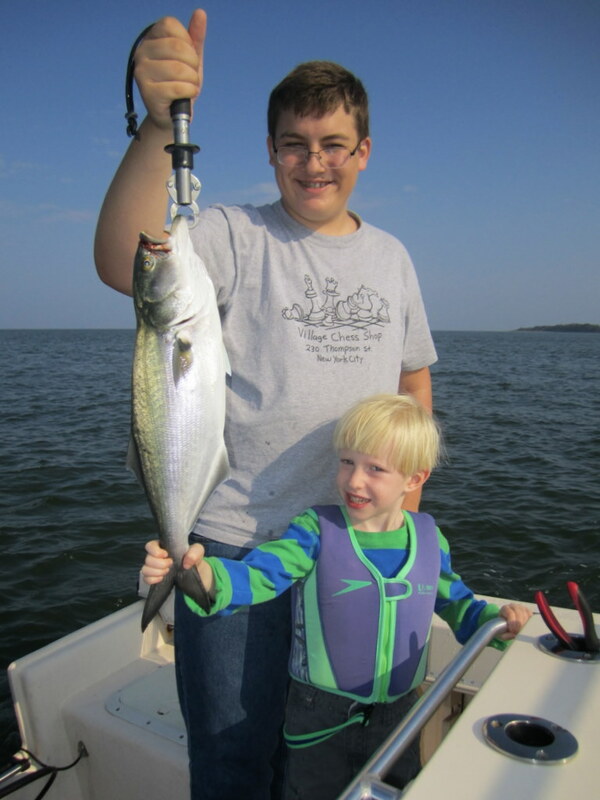 Andrew was able to land a nice bluefish and a small rock before the school sounded. As luck would have it, the flat-calm conditions were soon replaced by a strong chop from the south, so we took our cue and slipped into the protected waters of the Big Choptank. 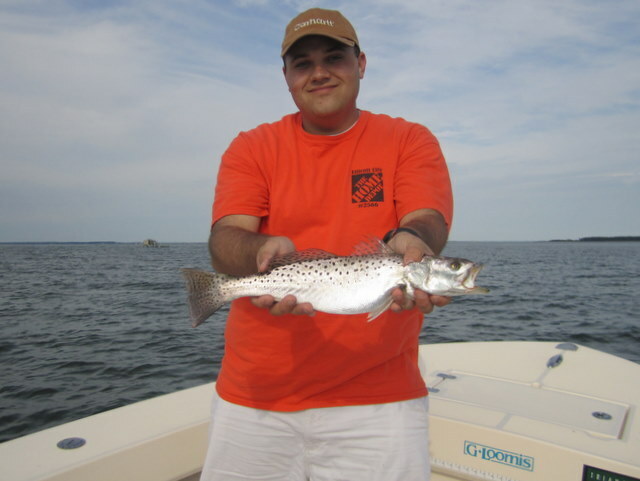 While the guys were busy feeding Bass Assassin shad tails to six-inch bluefish, James let out a holler and shortly thereafter I slid the new under a beautiful twenty-inch speckled trout. A nice surprise on a breezy afternoon. We tried a few more points and as the wind died out we traveled south for some evening topwater with shallow-water rockfish. After a slow start the rock came alive just as it was getting too dark to see. As the routine went, we heard a splash and the guys felt a tug as their popper was inhaled by a scrappy rock in the 22 to 24 inch range. This lasted perhaps an hour before the darkness enveloped us for good. It was a great way to finish the evening. On Saturday, September 10, Jake Leatherbury and his dad Rob met me near Saxis, VA for what started out as a speckled trout trip. This was a new experience for me as I trailered the Jones Brothers to an obscure ramp on Messongo Creek, just outside of Saxis. The tide was low, and the gnats hungry, but I managed to get the JB in the water okay and we pointed the bow west in search of some specks. It was not meant to be. The stronger than anticipated westerly breeze and low tide combination had roiled the shallows just enough to put the specks off their feed, so we resorted to Plan B. I was soon fishing more familiar waters over near Tangier Island. After a slow start, the tide picked up and so did the fishing. For the next couple of hours, Jake and Rob had good action on rockfish in the 17 to 23 inch range, great fun on the light-action G. Loomis Pro Green Series rods that I have really grown to like. As the rock fishing slowed, I asked Jake if he would like to see if the blues were hungry, since we had to travel right past my bluefish honey-hole on the ride home. He and Rob were more than willing to give it a try. Well, to say we finished-off the day on a high note was an understatement. Bluefish from 2 to 4 pounds attacked our offerings with abandon and, quite simply, put the weaker fighting stripers to shame. There’s simply no quit in a bluefish. We left ’em biting, which is always a good thing when you’re a guide. No specks today but I don’t think the guys had a complaint. Enjoyed the trip guys! 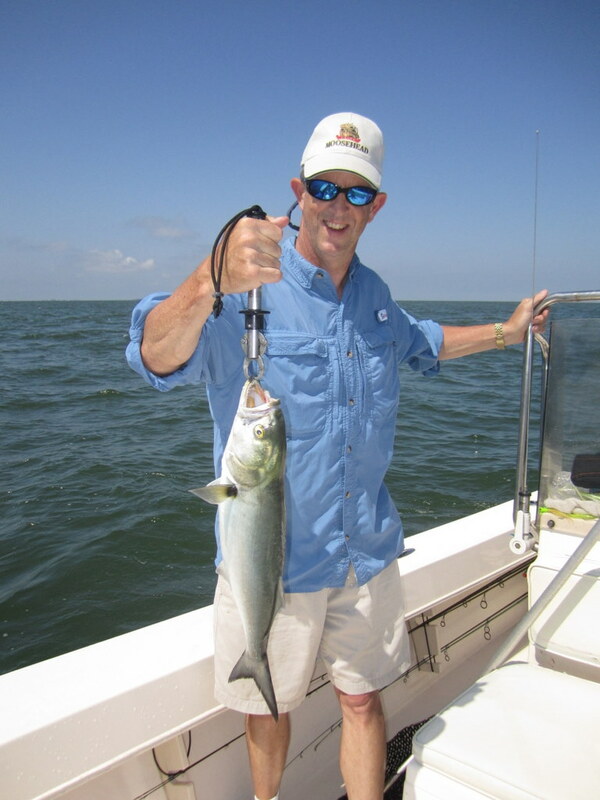 Stay tuned for more bluefish and speckled trout action in future reports! !